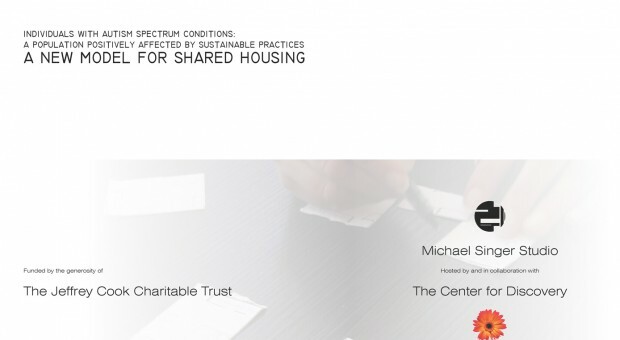 Michael Singer Studio, in collaboration with The Center for Discovery with generous support from the Jeffrey Cook Charitable Trust, has created a new model for shared housing for individuals with Autism Spectrum Conditions (ASC). This model employs design principles that embody a deep understanding of the complex behavioral, physical, and social needs of individuals with ASC, and an appreciation for the ways the physical environment can be shaped to contribute to and support their overall well-being. It is notable that many of the design principles conincide with sustainable design practices making the model more environmentally sustainable than traditional group home models. The Center for Discovery initiated the study due to a large number of current residents that are aging out of their programs for children; some of these young adults can live independently with supervision and other supports. The need for housing for adults with Autism is also a national issue so the model has broad application. One distinctive aspect of this shared living model is that residents live together with a care providing family living in a separate, but connected apartment. This housing arrangement provides for a higher quality of living compared to institutional or traditional group home settings, and help to foster meaningful relationships between residents and the family. The shared living model is for 4 residents living in a ground floor unit as part of a duplex home with a 2nd floor apartment housing a couple, a young family, or two staff, who can provide individual and group care.